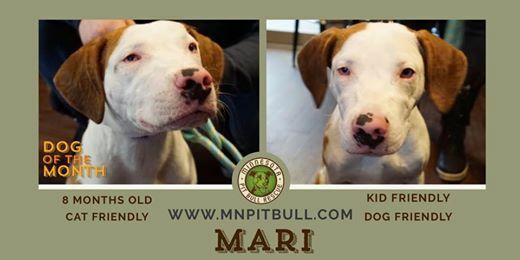 MN Pit Bull Rescue: 2.1.19 February Dog of the Month- Mari! Mari is February’s Dog of the Month! Things I do in my free time: Play with my squeaker toy, run laps in the yard, snuggle on the couch (I LOVE snuggles), & sniff my surroundings. Things I know: sit, no, kennel, my name, and come. Additional Info from foster parent: despite Mari's inability to see well, he is very aware of his surroundings. He will sniff everything in sight & you may even find him sniffing the air. Sometimes he can bump into things but this does not stop him. He is a very good listener and is redirected easily. He can get nervous when it is dark as he cannot see you as well so he likes to stay by your side. He is house trained & ready to find his home!